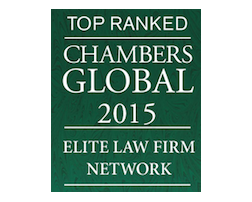 St. Petersburg, Florida (March 18, 2015) - TAGLaw® was recently ranked by Chambers & Partners as an “Elite” legal alliance in the publication’s annual Global rankings guide. Through membership in TAGLaw and its affiliated groups, independent member firms provide their clients with access to high quality legal, accounting and financial representation around the world. Karim Adel Law Office was established in 1939 as a pioneer law office in the field of 'International Business Law'. Since its establishment, the firm has offered a comprehensive range of legal services in Arabic, English and French to a wide variety of multinational companies and entrepreneurs. The firm's practice areas include: litigation, arbitration, hotel management agreements, shareholder agreements, franchise law, company establishment, and mergers & acquisitions. The firm is currently recommended by Chambers International for "Corporate and M&A" and The Legal 500 for "Dispute Resolution". Bone McAllester Norton PLLC is located in downtown Nashville, Sumner County and Williamson County, Tennessee. The firm provides representation for litigation, banking and commercial lending, corporate and securities transactions, mergers and acquisitions, intellectual property, entertainment and environmental matters, along with a full breadth of legal services ordinarily required by businesses and entrepreneurs. Popov & partners Law Office was established in 1998. The firm's talented team consists of over 40 legal professionals, including 18 attorneys-at law organized in two major departments: Consultancy and Representation and Extrajudicial and Judicial Collection of Receivables. Since 2007, the firm has been listed on an annual basis in the prestigious world chart for legal offices in Europe, the Middle East and Africa, and the Legal 500 EMEA Editorial Review. TAGLaw and new member firm Zilvarová, Ctibor, Hladký in the Czech Republic have been featured in a recent article by The Global Legal Post. The addition of Zilvarová, Ctibor, Hladký takes membership in the alliance to 153 firms around the world.